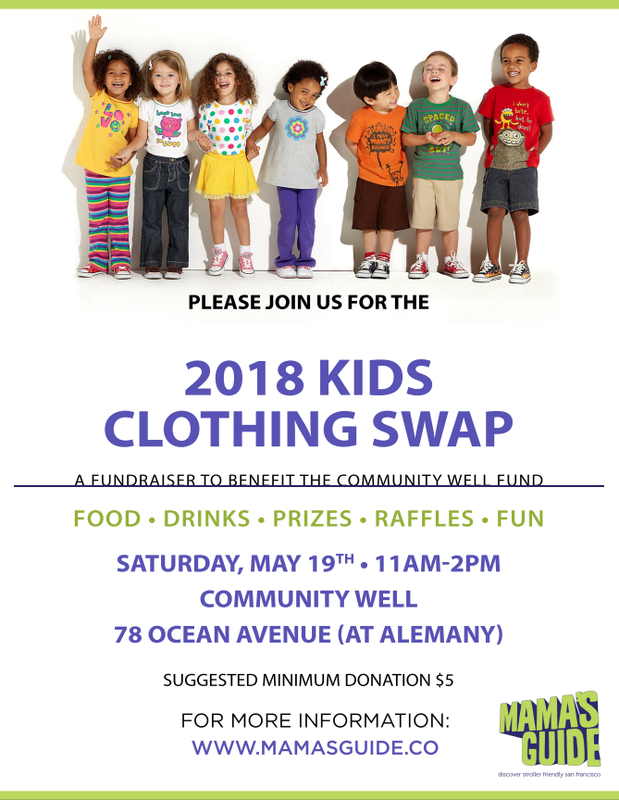 Join Community Well for our 2018 Kids Clothing Swap on Saturday, May 19th from 11-2pm organized by Mamas Guide and CW! Proceeds benefit Community Well's Scholarship Program! If you haven't participated in a swap before you're in for a treat! First, gather your new or gently used, clean kids clothing (think nice hand-me-downs) and bring them with you on Nov. 1. There we'll arrange them by size and for every item you bring, you get to select a new one! Please no cloth diapers, underwear, socks or pajamas. What if I don't see anything I want to take home? I'm sure you'll find something to take! But if you don't find anything you love for your kids consider picking something up for a future growth spurt, a gift for a friend, or even a crafting project! What will you do with the remaining items? All unclaimed swap items will be donated to the Homeless Prenatal Project. What sizes can I bring? Absolutely! Kids are welcome—Community Well has a great play area, along with bassinets, changing tables, diapers and wipes, nursing pillows, you name it! However, childcare will not be provided, so please keep an eye on your kiddies. What is the Community Well Fund? The Community Well Fund provides scholarships for individuals and families to receive holistic health services from a wide range of practitioners, from lactation consulting to acupuncture to family therapy! Community Well is a non-profit project fiscally sponsored by the non-profit Social Good. Your donation is tax-deductible to the extent allowed by law. Submit your donations HERE and in the "Message of Support" write in "CW Scholarship Program" or in cash at the door. Thank you for supporting Community Well!